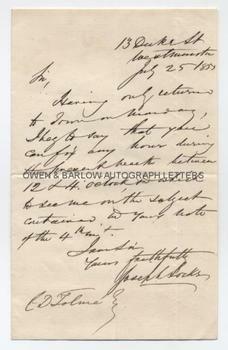 JOSEPH LOCKE Autograph letter Signed. ALS. 1p. 13 Duke Street, Westminster. 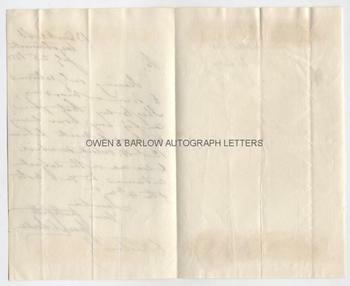 July 25th 1855. To J. D. Tolme. 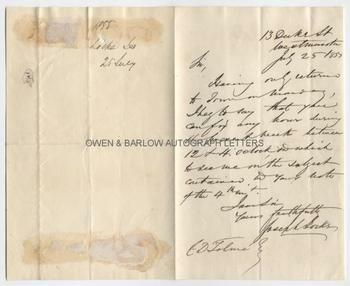 "Having only returned to town on Monday, I beg to say that you can fix any hour during the present week between 12 and 4 o'clock in which to see me on the subject contained in your note of the 4th inst." 8vo bifolium. Approx 7 x 4.5 inches (18 x 11 cms). Docketed and with mounting traces to verso of integral blank leaf. Near fine. Joseph Locke began his career working with George and Robert Stephenson but quickly rose to a position of eminence in his own right as one of the great Victorian civil engineers. He was a pioneer of railways, ranking alongside Robert Stephenson and Isambard Kingdom Brunel. Joseph Locke designed and built many great railway lines and other engineering projects and was elected as President of the Institute of Civil Engineers in 1857. It was Joseph Locke and Robert Stephenson who set the standard railway guage, when their proposal was preferred over that of Brunel.